I think this is one of my favorite stamp sets! I love the flowers because they are so unique and the saying is nice! I used the vase from the stamp set I played with yesterday. 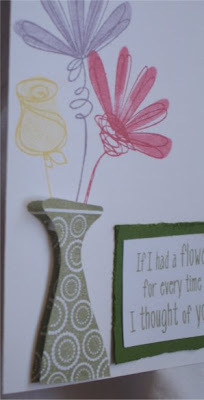 I stamped it on my card first, then stamped another one, cut it out, used raised glue dots and put it right on top of the other vase. I love the layer look! 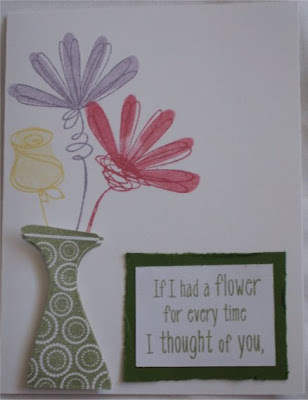 It makes a simple card not so simple! I like that the background stamp doesn't fit perfectly inside the lined stamp. So, yes, that is on purpose, it wasn't an accident :)>. Here's a side view of the card so you can see what the layer look is all about! It looks so much better in person! 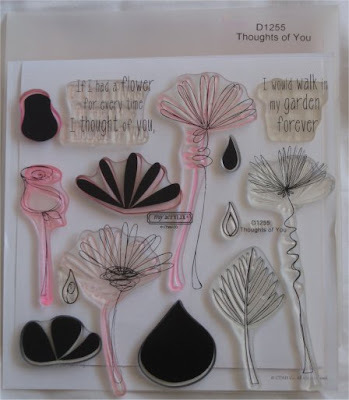 This stamp set is called 'Thoughts of You' and is by Close To My Heart. I know you're all just dying to have this stamp set!